Hope you've got your thinking caps on. Check back Saturday for the BIG winner! I think Mad Mad Margo is taking some time off and may not be running her heavy-duty caption contest this week, but check in, just in case.. Please, please don't eat me! It's not magnetism, it's gravity! Actually, I saw this pic last week in a cap contest on another blog. Then as is the case now my mind draws a complete blank with this pic. I think I'm more focused on nausea or something when I see it. Leroy had mastered the art of hynotizing chickens. What is this thing that has his arm wrapped around me? "Hey dude, don't laugh at my shirt. I've been told it makes me look 'oxymoronic'." Bobby just heard the sweetest thing a 300+ pound man can hear... She loves being on top. The Girl, thinking to herself: "OMG! He just sat down! Please don't take that picture, don't you dare take that picture! Really?." I think I'm having the same de ja vu as Don. I've been seeing this on a different blog and for a second I thought that's where I was. Howard set his chick magnet to skank. "Wonder if he'll still like that shirt when he discovers that I'm not really a chick?" Shortly after this photo was taken, Leroy learned the answer to the time old question...why did the chicken cross the road. To get the heck away from chick magnets like Leroy. If you think I'm fat, you should see my brother! Hey, baby...I'm finger lickin' good! Just roll me in flour and try to find the wet spot! I like my breasts battered. 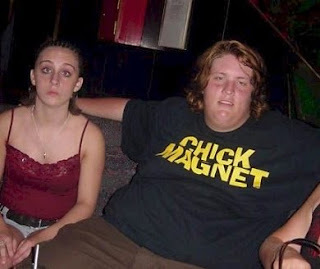 Unfortunately for Bill, magnets have a positive and a negative side, and the side facing chicks was the side that repelled them. Suzy regrets getting that metal eye, among many other things. Bobby Ray was totally psyched about how well he was doing with the ladies. It was the Best. Family. Reunion. Ever! I know I've got that "deer caught in the headlights look", but god help me I just don't know how I was convinced to allow this pic! I'll never live this down! Ok, so I put some drugs in her drink and now she looks like a zombie. It worked didn't it!?! Besides, zoned out is the way I like 'em! Even as a teenager, and long before he ever met Princess Leia, Jabba the Hutt had a thing for short, skinny brunettes with weird hair. World renowned ventriloquist Paul "Lunchbox" Andrews will be appearing (along with his vacant stared doll) at the Grand Opera House this Wednesday at 7:45.